Though it memorializes a tragic event, the Path of the Flood Trail is a beautiful, tranquil trail. In 1889, more than 2,200 people lost their lives in the Johnstown Flood when the South Fork Dam failed. The 9-mile-long trail closely follows the course of the flood waters on their deadly path to Johnstown. Comprised of on- and off-road sections, the trail incorporates the two-mile long Staple Bend Tunnel Trail, managed by the National Park Service. : From U.S. 219, take the exit for State Route 53 North, South Fork and Portage, and turn west on SR 3024 (Railroad Street) toward South Fork. Turn right over the bridge at Oak Street, then right onto Portage Street which becomes Second Avenue in Ehrenfeld. Turn left onto Penn Street to the Ehrenfeld Ballfield Trailhead. To access the Staple Bend Tunnel Trailhead, take PA Route 271 to Mineral Point Road, then turn right onto Beech Hill Road. Continue under the railroad underpass to the trailhead on your right. The Path of the Flood Trail is an integral part of the Pennsylvania Main Line Canal Greenway. Crossing over from a recreation trail to a trail promoting history and heritage, this facility also has opened avenues to community and economic development as well. By working with a diverse group of partners including local municipalities, private industry, the Pa. Departments of Conservation & Natural Resources and Transportation, the National Park Service, and local volunteer groups, this trail became a reality. 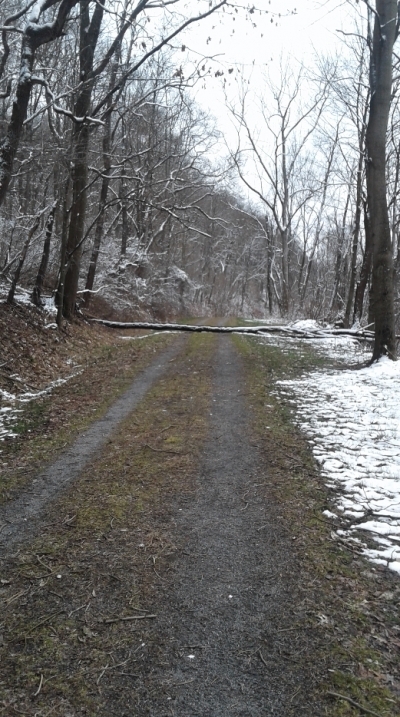 The Path of the Flood historic trail extends from Ehrenfeld Borough Park and follows the path of the devastating Great Johnstown Flood of 1889. Interpretive signs relate the story of the rushing waters and the terrible aftermath. Continuing to Mineral Point, the trail joins the 2-mile-long National Park Service Staple Bend Tunnel Trail. From the end of the tunnel, a primitive ¾ mile hike connects to the crushed limestone-surfaced trail to the Franklin ball field where a share-the-road route continues to the Flood Museum in the City of Johnstown. This is a unique trail that combines both the best of rural and urban trails. Beginning in a small picturesque town, the user is quickly greeted by a cascading waterfall, lush woodlands, wildlife and wild flowers that greet the senses at every turn. It offers a trip back in time through the oldest railroad tunnel in the United States, the Staple Bend Tunnel, and then on to the bustling streets of the City of Johnstown. The Path of the Flood Trail is a unique experience available to residents and visitors of all ages that at once is a voyage into one of this Nation's most horrible disasters, yet at the same time providing a quiet, relaxing walk in nature. During the summer months, the trail is heavily canopied with large trees, and native wildflowers flourish throughout the section leading from the tunnel to Franklin ball field. Benches along the trail overlook an active rail-line and a lush green valley. Orientation kiosks with a trail map, regulations and other information are located at Ehrenfeld Park Trailhead and Staple Bend Tunnel parking lot. Along the way, you will find six interpretive wayside exhibits with historic photographs that explain what took place when the dam broke on that fateful day of May 31, 1889. While in the area, you may want to learn more about the 1889 flood and the heritage of Johnstown by visiting the Johnstown Flood Memorial, the Johnstown Flood Museum and the Johnstown Heritage Discovery Center.